Down-to-earth basics on homebrewing, information for how to get started, recipes for brewers and links to the community of homebrewers. The brewer is a marvelous kind of extremist, one who is a cross between a chemist and a magician, infused with a bit of artistic surrealism...and a love of hops! Ask the Beer Fox - What Are Noble Hops ? Ask the Beer Fox: What are Noble Hops? Why are they such a prized component in some styles of beer? Spread the pleasure of beer, good cheer and brewing with this fine selection of BellaOnline Recommended products, books, and services. The Beer Fox has reviewed these items for quality and value, and chooses them as the crème de la crème for Beer Lovers. A craft beer movement of magnanimous proportions is beginning to explode throughout areas of South America, particularly in Argentina, Columbia, Peru and Brazil. So how do you become a beer judge? Why would you want to evaluate beer? What are those subtle flavors and aromas you have been discovering in your latest round of craft beers? Malt is the beauty that imparts so much abundant flavor and sunset color. Hook up with the Number One homebrew magazine in the world! Homebrewing help from Newfoundland! Tips problem solving, supplies and a brewers´ library for homebrewing both beer and wine. Sam Calgione, founder, rocket fuel, and energy behind Dogfish Head Craft Brewery provides a rare glimpse inside the world of entrepreneurship in his book, Brewing Up a Business, first published in 2005. Your perfect evening can be quashed in a moment if your beer is served flat, stale, or has an off-flavor that you just cannot seem to identify. What makes beer flat or develop off-flavors? Premier website for every facet of homebrewing - Articles, supplies, resources, more! New to brewing? This site has clear, easy-to-understand information for homebrewers. From time to time, the Beer Fox scours through cyberspace, seeking threads of evidence that might reveal the intensity and depth of "your" love for beer. Community for all styles and aspects of homebrewing. Incredible "how-to" site for beginner homebrewers - includes clear instructions for 3 types of beer techniques, equipment needed with photos, and glossary of terms. 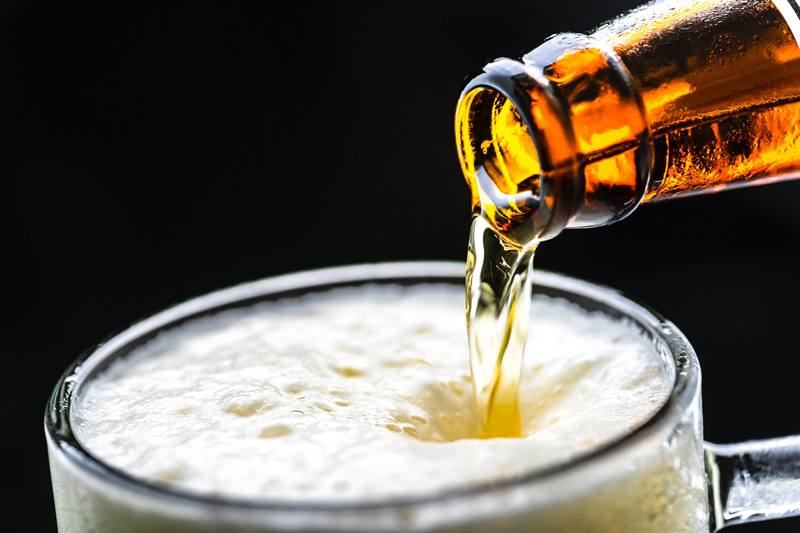 Celiac Disease can be a depressing diagnosis for those who love the malty sweetness and spicy hop bite of the golden brew. Why not brew your own gluten-free beer? Is Beer the Secret Spice of Life ? Discover the secrets of herbs and spices, crafted into beers with tantalizing results. Absolutely the best of the best! Online shopping plus two store locations in Pennsylvania, USA! Homebrew supplies, beer signs, steins, bar equipment, and keg equipment. "How to" articles online, Homebrew Club and great Newsletters! Naming a beer creation is not exactly like naming your newborn child, although the love can be just as powerful. The original recipe for Poor Richard´s Ale, designed by the master himself! Includes sources for reference. If Ben Franklin raised a glass of Poor Richard’s Ale, what kind of ‘salut’ would he bestow upon those gathered to celebrate his 300th birthday? Use this table as a generalized guide for recommended serving temperatures of beer, according to style. "There’s nothing better than finding a really good beer...then brewing it yourself,” says Kevin Flood of Salt City Brew Club. General beer information centered around brewing for the home enthusiast. Site for homebrewers by homebrewers with a passion for brewing. High quality information, resources, tools and links to the brewing community. This site is not associated with any commercial entity. This is the brewer’s bible of homebrewing books. Yeast has the ability to impart specific flavors to beer, just as surely as sourdough starter imparts a distinctive flavor to a loaf of French bread. Are you ready to "pitch the yeast" and brew your own beer? Master of Homebrewing, John Palmer, takes the mystery out of homebrewing and whets your appetite for an adventure in fermentation-land. They are the kings of grain, the masters of yeast, the heralds of hops. They may be chemists, nuclear engineers, or warehouse workers, but all have found a common thread that binds them together. What are IBU´s and why should I care?